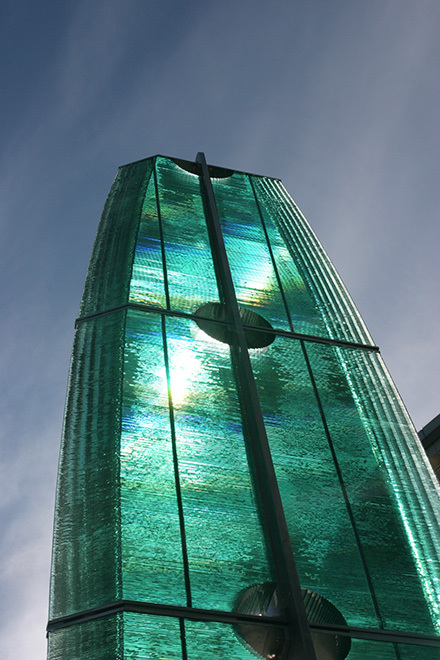 This landmark sculpture by Danny Lane was commissioned in partnership with Land Securities, to complement the distinctive glass façade of The Gate entertainment complex in Newgate Street. The proposal was developed through Grainger Town's commitment to encourage the private sector to commission artists within capital developments in Newcastle. ‘Ellipsis Eclipses’ is 12 metres high and is reminiscent of the mast of a tall ship. The name is a play on words based on its form, which is derived from the intersection of two circles (or ellipses) like the eclipse of the moon or sun.